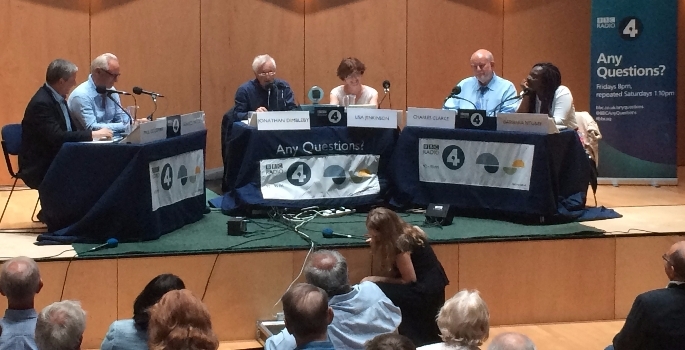 At the end of another astonishing week in politics, Brentwood School was proud to host renowned political commentator Jonathan Dimbleby for a recent episode of BBC Radio 4’s Any Questions?. The veteran presenter was joined by an eminent panel of political heavyweights who fielded a number of questions posed by the packed Wessex Auditorium audience. The programme was aired live on Radio 4. The Any Questions? roadshow was invited to the town by Brentwood’s University of the Third Age (U3A) who joined the School in welcoming former Home Secretary Charles Clarke, the Executive Editor of the political website ConservativeHome Paul Goodman, former Trade Minister and Minister to the Cabinet Office Lord Maude of Horsham, and the Momentum activist Barbara Ntumy. They tackled topics including the French truck attack, the election of Theresa May as Prime Minister, Boris Johnson as Foreign Secretary, and the Labour Party leadership contest.